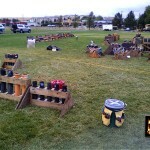 Recently I worked my second display show with EFI for the University of Idaho’s home coming celebrations. Here is how it all went down. Or I should say as best as I can remember. All the times should be read with an ish following as I am really only guessing from memory. 6:30am October 7th – Left my house for the EFI warehouse. Why do I have to get up so early for something that always starts after dark? 7:00am – Detours and wrong turns, at this point I am thinking that I will be lucky to get to the warehouse before sundown! 7:25am – Wow I made it to the warehouse early. Not sure how that happened. Loaded up the truck, filled out some paperwork. Then on the road! 10:30am – After a few stops we have arrived. Great conversation on the road, maybe got in 5 words. Its ok Rich is a great storyteller. It was great getting to know him better. 10:45am – Some concern about the wind, however it should slow down as dark approaches. Rich talks it over with the Fire Marshal, and agrees to a test shot before the show to determine if the winds are calm enough. FYI it was freaking cold out! 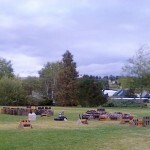 1:00pm – Setup is almost done. Most of us agree that its now much colder and winder then when we arrived! 2:00pm – Setup is mostly done and its time to eat. Pictures below are round about that time. Click on the images to see em full size. Also what do you get when 5 guys eat chilly in the back of a an empty cargo truck? 8:00pm – Winds are all but gone now. Test shell goes up just as expected, and we have a green light for the show. Its now warmer then it has been all day, or maybe that was the chilly doing its thing? 9:00pm – Safety meeting, and crew assignments. 9:15pm – Show starts, hand lit for the main body. 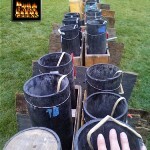 Some mines, comets, and roman candles are triggered electrically. No problems at all! Turned out to be a great show, and reminds me why I get up early in the morning to do this! 10:00pm – Clean up is done, head back home. 12:20am October 8th – Back at the warehouse. 1:00am – Back home. That was a good day! 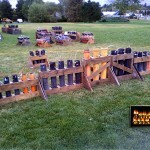 This entry was posted in Display Fireworks and tagged 1.3g, Comets, Mines, Shells by Richie. Bookmark the permalink.